The Ambash Affair is both simple and complicated. Daniel Ambash was sentenced more than three years ago by a court in Jerusalemto 26 years in prison and his family was broken up. It was made up of six women, four of whom were jailed for a year, and 17 children (13 of them Daniel's children). Most of these children are now in institutions. The principal charges were: a dangerous cult; mental enslavement of the six women by Daniel Ambash; and abuse by the latter of the women and children. We learned of the existence of this "affair" about a year ago through a friend, the filmmaker, Jessica Vaturi-Dembo, who, persuaded that this Family had been the victim of a grave injustice, conceived the project of a film in order to make these six women known. And Friday, 11 March, at the Tel Aviv Cinémathèque, we saw an extract from this film in progress. And we listened to three of the women who had come to address the audience, Aderet, Shiran, and Azmara. On this occasion, we received the book which has just come come out in three languages, and which presents this "affair" in addition to the testimonies of the women. Jean-Pierre has known the author of this book, Georges-Elia Sarfati, for several years. He had supported the project of the Popular University of Jerusalem to teach Jewish history and philosophy. This project had been launched by Georges-Elia and Jessica, one of whose goals was to counter with knowledge the campaigns for delegitimizing Israel throughout the world (and in Israel as well), reactivated by the books (best-sellers in France) of the Israeli historian, Shlomo Sand. Precisely Georges Sarfati was one of the first to respond to him with a powerful, well-argued and scathing text. After meeting in a public place with the three women and after reading the book, Ambash Affair we said to ourselves that one could not know all that we know and not say that we too believe in the innocence of Daniel Ambash. However, beforedoing so publicly, we wanted to meet the women again directly in private in order to be able to listen to their answers to certain objections that had been raised by some of our close friends. This is what we did on Wednesday evening, 16 March, for four hours, from 8 pm to midnight, with two of the women, Shiran and Aderet. And this was after a long day of work on editing our film in progress. But before presenting their account to you, it is necessary that you know who we are and the reasons for our commitment. We are both filmmakers. Ziva was born in Israel and worked for 25 years in France as an editor, then chief editor, and after editing Shoah, the film of Claude Lanzmann, she came back to her country and directed several documentary films. Jean-Pierre, a director, had to flee Algeria in 1993 for France, following Islamist threats, and made aliyah in 2011. He is currently directing, with Ziva as producer and chief editor, a film that will test his former (negative) prejudices about Israel against reality. As to the reasons for our commitment, despite the heavy load that directing this four-part film –a total length of 10 hours—entails, they are very simple. Beyond the fact that Ziva knew Daniel Ambash as well as his parents, it is above all the deep-seated conviction of his innocence that moves us to act. But it is also our even stronger conviction that Israel which gave The Law to humanity owes it to itself to give an example. Lastly, we think that our country is sufficiently burdened so that it should notsupply a new pretext to the professionals of besmirching her. The principal accusation against Daniel Ambash is that he was the leader of a cult: his own family. And some of our friends, while admitting to knowing nothing about this Affair, could not prevent themselves from telling us: "This has all the signs of a deviant cult." Now, having become familiar with the essential documents of this case which are accessible on the excellent website, www.danielambash.info , and after having spoken with the two women for four hours, we can say that the functioning of this Family resembles precisely anything BUT that of a cult. Each one of us had had to reflect in fact on the social phenomenon of a cult. Jean-Pierre in Algeria wrote a great deal on the cult mode of functioning of totalitarian systems and traditional systems of a clan or tribal nature. And Ziva had been confronted among her close friends with the case of a young woman who had left her family definitively for the Hare Krishna cult. This young woman accused her father of sexual abuse and that posed grave problems in the family, up till the day that several families that were victims of that cult got together and discovered that all the fathers had been accused by their children . . . of the same misdeed! Both of us arrived at an understanding –through different experiences-- that what characterizes cults, whatever their kind, is their closed nature, a hermetically closed nature. Totalitarian societies and pre-democratic societies (clans, tribes) become autistic. As to families, they cannot have access to their children who have entered a cult. And if they succeed in having access, thanks to the law in democratic countries, the children remain totally impenetrable and insensitive to external stimuli. Now what is striking in the way of life of the Ambash Family is precisely openness. Totally porous openness! The proof supplied by the countless family videos that can be seen on the site. The proof demonstrated by the total freedom of movement of the women and children. The proof supplied by the perpetual movement of this street theater troupe in the commedia dell'arte tradition which performed throughout Israel. The proof provided today by these women who take all sorts of initiatives and display an extraordinary inventiveness to make the truth known. The proof is even provided by the defamatory television report on Arutz 2 which prepared public opinion to accept the arrest of Daniel Ambash and the dismantling of his family. The Family indeed did not see anything wrong in allowing moviemakers to enter into their private life and film them as they saw fit, without the least supervision. And the moviemakers, not succeeding in filming one single image which accredited their cult thesis, allowed themselves to produce a sordid manipulation, at the moment of editing, through the commentary and through frightening music, in order to lead the spectator to think "this cult is hiding its game very well. . . . "
Lastly, a proof a contrario: the judicial system could not derive any advantage from the photos taken without the knowledge of the Ambash Family for months, day and night, by a camera hidden in the family home. Furthermore, it was the chance discovery of this camera by one of the children that caused the arrest of the whole family in the hour that followed. This Family, whether Daniel or the women, never wanted to hide anything for the simple reason that they had nothing to hide. They believed on the contrary that they were good Israeli citizens, participating in their own way in the extraordinary diversity that characterizes the Jewish people, in the past before the creation of the State, as well as after it. Why So Relentless Against This Family? This is a question that we constantly ask ourselves. We find only one answer: The Ambash Family was disturbing. It was disturbing due to its way of life: six women living with only one man. It disturbed people like us who remain attached to the way of life based on the union of one man and one woman, which is still dominant in our time. It disturbed the ultra-orthodox milieu, called haredi, from which the first denunciations –libelous and anonymous-- emanated, for the Family lived in the Romema Quarter of Jerusalem. And it certainly awakened among them the profound hostility which Bratzlaver Hassidism –with which Daniel Ambash and his Family identify themselves-- has aroused since the 18th century in Europe. It also disturbed a certain intelligentsia which insists on calling itself "on the Left" and which, like the historian Zeev Sternhell, harbors a visceral hatred towards all groups of the "religious" no matter how diverse. Added to this detestation emerging from sources both diverse and opposed, was the very healthy detestation on the part of the broad public towards the cults that freely proliferate in Israel. Does the Ambash Family stand a chance of being rehabilitated facing such an objective coalition, which gathers together all categories of the population? The judicial system has the duty of telling the truth, even if this truth disturbs the majority, and therefore it is also duty bound to go against the current. Despite our present skepticism, so badly did this "Affair" start off, we believe that justice will necessarily finish by being done. Our conscience as Jews and citizens gives us this hope. The more voices that call for justice, the sooner will it be done. The judicial system in our country, precisely in this Affair, has already shown that it knew how to walk back its own judgement. In effect, the four women jailed for a year, were exonerated once the judicial system was convinced that the accusation rested only on interrogations that did not conform to the rules and on false testimonies extorted by different types of pressure. Soon, on 28 March, following the appeal of Daniel Ambash, the punishment incurred by him (26 years in prison) will be either annulled by the Supreme Court judges, or confirmed or even aggravated at the request of the Prosecution (to 65 years in jail). The first possibility would be miraculous in the present context. The second, the more probable, invites from now on a long-term commitment for which the only motivation is the Jewish ideal of justice. These last two weeks, we have addressed ourselves to our closest friends with the purpose of informing them and alerting them. Some subsequently asked what to do. Most preferred not to take a stand: the case is certainly very complicated. Some who at first were silent since they really believed that it was a cult that was involved, thanked us for having taken the time to listen to these women. Others finally raised objections. We thank all of them. "It has 'the appearance of a sect"
"'Certainly'! Shiran and Aderet exclaimed in unison"
"But everything was done to that end. Do you want examples?" A manipulative report broadcast on Channel 2 TV (program "360") was edited precisely in order to give credibility to the idea that the Ambash Family was a cult. And since there was no image that could prove that, the report was followed by a discussion to which two protagonists of another cult affair, of the Ratson cult, were invited. The report and the discussion were broadcast four months before Daniel's arrest, and aimed to identify Ambash with Ratson, who was indeed a true guru and his twenty or so women were truly ill . . . . Exactly 25 days after Daniel's arrest and 2 years before the judgment, the chiefs of the police and the social services in Jerusalem, in a press conference, assured the 50-odd journalists that the Ambash Family was indeed a "sadistic cult in Jerusalem." "Everybody was allowed to speak, but we, we were forbidden to speak, and we may again be condemned for not having respected this prohibition." "Polygamy is forbidden in Israel"
With the nuance that it is not forbidden to Muslims, the women drew our attention to the fact that "Daniel Ambash was accused of several things (notably, mental slavery and abuse of the women and children), but not ofpolygamy!" "The law could not indeed be opposed to the fact that we had decided to live with the same man. Therefore they invented the story of a cult." "The Consent of the Women is sadly banal"
"This person is quite right! The 'consenting women' are victims!" But we are not 'consenting women.' We refuse to be classified as 'consenting women.' This family, this construction, it is we who wanted it. It is we the women who made it! If there is someone who was 'consenting' in this affair it was rather Daniel. He should be seen as the victim!" "Children deprived of school and pushed into begging": A doubly false statement. Schooling. One of the women, Aderet, was a primary school teacher by profession. She explained what happened to us: Following the example of the adults of the ultra-orthodox neighborhood of Jerusalem where Daniel's family lived, notably in the neighborhood school, the children began to harass the Ambash children. Thus, the family made the decision to remove the children from the school and, together with other families, they founded a private school with their own funds. Private education indeed exists in Israel. We know of other examples where families took direct charge of schooling their children. We don't know if this practice is illegal but it cannot be said that the Ambash children were left without education. "The social services who interrogated the children well know that, since they were amazed at the intelligence and knowledge of the children," Shiran asserted. Begging: Aderet and Shiran told us that the Ambash children had been especially filmed without their knowledge for a very long time, precisely to obtain a proof of begging. But not even the least image illustrating this practice could be brandished against Daniel during the trial. These two last grievances were evoked by a friend who based himself on the testimony of one of the children who, he said, had been at his home a few days earlier. "What this child can no longer say is his own true story. After the father's arrest and the 'sheltering' of the four womenin institutions, the women were isolated one from the other, without a telephone and thus incapable of making contact with the outside world. Daniel's three older children who had been left at liberty (since the minor children were also put into institutions and were subjected to various pressures) did everything they could to defend their father: going to lawyers, looking for support among friends in order to pay them, etc . . . That was displeasing and they were arrested. Today this young man, 'supported' by the anti-cult association is now persuaded that he was the victim of a guru." The women take out their iPhones and show us photos of this child several years earlier (that can be seen on the site www.danielambash.info ): "Does he really look like a child who was the 'victim of dangerous guru' as your friend says?" they ask us. They then show us dozens of video clips where all the children are actors, clowns, and musicians. "The Ambash home was transformed into a theater, a recording studio, and a concert hall!" And we can easily imagine that for the children, it must have been paradise. On the other hand, Ziva and I who have worked for a total of 90 years on images, formally affirm that there was no sign of fear or "mental slavery." This is how our abovementioned friend characterized Daniel, as if that could be a reason for an accusation. Daniel was indeed "non-standard". He was a highly talented dancer who had worked with the greats of his art (notably Maurice Béjart). He abandoned that career in order to come to Israel, do teshuvah there, and become involved with the spirituality of the Bratzlaver hassidim. His parents were artists, his mother a painter and his father a moviemaker (Ziva already knew Daniel and his parents in Paris). Daniel was later on seduced by the music of another non-standard personality, the rabbi-hippie-Bratzlaver hassidic singer, Shlomo Carlebach, whose melodies overwhelm us. The first of the women incriminated, Ilana, is also non-standard. She is a violinist, a women's champion of kung fu in France, a practitioner of teshuvah too, and she married Daniel against the will of her parents who lived in France. A whole family transformed into artists and made up of six women, one man, and 17 children, lived in harmony and indeed everything about the Ambash family was non-standard. But what is criminal about that? Is it Israel's mission to only produce the standard? Wednesday evening, Ziva and I listened to two magnificent women: Aderet and Shiran. Like the two others, Ilana and Azamra, they never gave in, despite the trying interrogations, during the year in prison which was inflicted on them, as well as the separation from their children. Two lively women who made us laugh a great deal, by the way. They reacted automatically to all our questions, without hesitation, without choosing their words, in a word, without trickery. They were not at all aggressive. On the contrary, without a great deal of distance and with a sense of humor, despite the immense tragedy that had crushed more than one of them. With their gift of comedy, they preferred to mock everything that they had undergone. They argued and took our reasoning and our logic as witnesses. For example, "If we were 'mental slaves' as was said, would it not have been necessary to have us benefit from psychological treatment and help rather then being put in jail?" Or again: "Why did the judicial system acquit us once it was convinced of the false testimonies of certain witnesses, while keeping Daniel sentenced to jail on the basis of the same false testimonies?" (see the rubric "Perjury" on the site). It is not within our competence or our desire to go on at length about the propriety of the judgment. On the other hand, what we can surely attest to, unless we are subject to "Daniel Ambash's telepathic powers," is that these women are not "mental slaves" of their supposed guru (whom they have been separated from for more than four years). These women are not at all zombies. Believe us! Despite the disaster that crashed down on this family, instead of keeping quiet, they speak. Instead of closing themselves up, they go towards the world. Instead of being aggressive and making recriminations, they explain. Instead of attacking their people or the authorities, they content themselves with testifying and answering, without annoyance, all the questions that one might ask them. Instead of weeping, they laugh and sing. Such is not the attitude of people who consider themselves guilty. On the contrary. For us, they are an example of the Jewish response in trying circumstances. Really, we are proud of them, and we told them that we will support them. We are convinced that we will not be the only ones, even if it takes time for everyone to be able to form his own opinion. We must also add that if we left these persons in danger without assistance, we would be giving grist to the mill of all those who have made a specialty of detesting their own country, in the name of Morality and the principles of human rights, shamelessly allying with those who purely and simply desire our disappearance as a country and as a State. We believe in morality and in the principles of human rights, but in order to strengthen our country, not to destroy it. We are very saddened that so much energy has been and continues to be wasted for such a tragic result as the imprisonment, almost for life of a man, non-standard to be sure, and the breaking apart of a family that was happy. Therefore we call upon all women and men of good will to become informed and to act in their soul and their conscience. In four hours, Aderet and Shiran told us so much and we have transmitted so little to you, but we won't say anymore about it. The site in three languages is excellent: www.danielambash.info . There are now books of testimonies in three languages (Hebrew, English, and French). The women told us that they can send them to whoever wishes them. They are also ready to speak to all those who want that. We can help in that. For direct meetings, our home will always be open. Best wishes to everyone and very sorry for all of your time that we have taken. "L’Affaire Ambash", c’est à la fois une histoire simple et compliquée. Daniel Ambash a été condamné il y a plus de 3 ans par un Tribunal de Jérusalem à 26 ans de prison et sa famille a été démantelée : elle était composée de six femmes dont quatre furent aussi emprisonnées durant une année, et de dix-sept enfants (treize ayant pour père Daniel) aujourd’hui pour la plupart en institution. Les chefs d’accusation principaux sont : secte dangereuse, esclavage mental des 6 femmes par Daniel Ambash et abus de ce dernier sur les femmes et les enfants. Nous avons appris l’existence de cette"affaire " il y a environ une année par une amie cinéaste Jessica Vaturi-Dembo qui, persuadée que cette Famille était victime d’une grave injustice, avait conçu le projet d’un film pour faire connaitre ces 6 femmes. Et vendredi 11 Mars à la Cinémathèque de Tel Aviv nous avons vu un extrait de ce film en gestation, et écouté 3 des femmes venues s’adresser au public, Aderet, Shriran et Azmara. A cette occasion nous avons reçu le livre qui vient de sortir en trois langues et qui, hormis les témoignages des femmes, présente cette"affaire ". Jean-Pierre connaissait l’auteur de ce livre, Georges Sarfati, depuis quelques années. Il avait soutenu le projet d’Université populaire à Jérusalem pour enseigner l’histoire et la philosophie juive, lancé par Georges et Jessica, dont l’un des buts était de contrer, par la connaissance, les campagnes de délégitimation d’Israël dans le monde (et en Israël même), réactivées par les livres (best-sellers en France) de l’historien israélien Shlomo Sand auquel justement G. Sarfati, un des premiers, répondit par un texte puissant, autant argumenté que cinglant. Après la rencontre dans un lieu public avec trois des femmes et la lecture du livre"l’Affaire Ambash " nous nous sommes dit que l’on ne pouvait plus savoir tout ce que nous savions et ne pas dire que nous aussi croyons en l’innocence de Daniel Ambash. Cependant, avant de le faire publiquement, nous voulions encore rencontrer directement ces femmes en privé, afin de pouvoir écouter leurs réponses à certaines objections dont nous avaient fait part quelques-uns de nos proches amis. C’est ce que nous avons fait mercredi soir, le 16 Mars, durant 4h, de 20h à minuit, avec deux des femmes, Shiran et Aderet, et ce, après une longue journée de travail sur le montage de notre film en cours. Mais avant de vous livrer leur récit, il est nécessaire que vous sachiez qui nous sommes et les raisons de notre engagement. Nous sommes tous deux des cinéastes. Ziva née en Israël, a travaillé 25 ans en France comme monteuse puis chef-monteuse, et après le montage de "Shoah", le film de Claude Lanzman, elle est revenue dans son pays et a réalisé plusieurs films documentaires. Jean-Pierre, réalisateur, a dû fuir l’Algérie en 1993 pour la France, suite aux menaces islamistes, et a fait son alya en 2011. Actuellement il réalise, avec Ziva comme productrice et chef monteuse, un film qui mettra à l’épreuve de la réalité ses anciens préjugés (négatifs) vis-à-vis d’Israël. Quant aux raisons de notre engagement, malgré la lourde charge que représente la réalisation de ce film en 4 parties, d’une durée totale d’environ 10h, elles sont très simples. Au-delà du fait que Ziva avait connu Daniel Ambash ainsi que ses parents, c’est surtout l’intime conviction de son innocence qui nous pousse à agir. Mais aussi notre conviction, encore plus forte, qu’Israël qui a donné la Loi à l’humanité se doit de donner l’exemple. Enfin, nous pensons que notre pays est suffisamment accablé pour ne pas donner un nouveau prétexte aux professionnels du dénigrement. Le chef d’accusation principal à l’encontre de Daniel Ambash est donc qu’il était le chef d’une secte : sa propre famille. Et quelques-uns de nos amis, tout en avouant ne rien connaitre de cette"Affaire ", n’ont pu s’empêcher de nous dire : "Cela a tout l’air d'une dérive sectaire". Or après avoir pris connaissance des pièces essentielles de ce dossier accessibles dans l’excellent site www.danielambash.info , et après avoir parlé avec ces deux femmes durant 4 heures, nous pouvons dire que le fonctionnement de cette Famille ressemble à tout SAUF précisément à celui d’une secte. Chacun de nous deux, en effet, a eu à réfléchir au phénomène social de la secte. Jean-Pierre, en Algérie, a beaucoup écrit sur le mode sectaire de fonctionnement des systèmes totalitaires et des systèmes traditionnels de type clanique ou tribal. Et Ziva a été confrontée, parmi ses proches amis, au cas d’une jeune fille ayant quitté définitivement sa famille pour la secte des Hare Krishna. Cette jeune fille accusa son père d’abus sexuels et cela posa de graves problèmes dans la famille, jusqu’au jour où différentes familles victimes de cette secte se réunirent et découvrirent que tous les pères avaient été accusés par leurs enfants…. du même méfait ! L’un et l’autre donc, sommes arrivés, par différentes expériences, à comprendre que ce qui caractérise les sectes, quelle que soit leur nature, c’est la fermeture, fermeture hermétique. Les sociétés totalitaires et anté-démocratiques (clans, tribus) deviennent autistes. Quant aux familles, elles ne peuvent plus avoir accès à leurs enfants entrés dans la secte. Et si elles y arrivent, grâce à la loi dans les pays démocratiques, les enfants, eux, restent totalement blindés et insensibles aux stimulus extérieurs. Or ce qui frappe dans le mode de vie de la Famille Ambash, c’est justement l’ouverture. Une ouverture et une porosité totale ! La preuve par ces innombrables vidéos familiales que l’on peut voir sur le site. La preuve par la liberté totale de circulation des femmes et des enfants. La preuve par le mouvement perpétuel de cette troupe de théâtre de rue dans la tradition"commedia del arte " qui se représentait dans tout Israël. La preuve aujourd’hui par ces femmes qui prennent toutes sortes d’initiatives et font montre d’une extraordinaire inventivité pour faire connaitre la vérité. Preuve enfin, à contrario : la justice ne put tirer aucun profit des images prises à l’insu de la Famille Ambash durant des mois, jour et nuit, par une caméra cachée dans la demeure familiale. C’est d’ailleurs la découverte par hasard de cette caméra par un des enfants qui causa l’arrestation, dans l’heure qui suivit, de toute la Famille. Cette Famille, que ce soit Daniel ou les femmes, n’a jamais voulu cacher quoi que ce soit, pour la simple raison, qu’ils n’avaient rien à cacher, croyant au contraire qu’ils étaient de bons citoyens israéliens, participant à leur manière de la diversité extraordinaire qui caractérise le peuple juif, dans le passé avant la création de l’Etat, comme aussi depuis. Pourquoi donc un tel acharnement contre cette Famille ? A cette question que nous n’arrêtons pas de nous poser, nous ne trouvons qu’une seule réponse : la Famille Ambash dérangeait. Elle dérangeait par son mode de vie : six femmes vivant avec un seul homme. Elle dérangeait les gens comme nous qui restent attachés au mode de vie fondé sur l’union d’un homme et d’une femme, encore dominant de nos jours. Elle dérangeait le milieu ultra-orthodoxe, dit harédi, dont ont émané les premières dénonciations calomnieuses et anonymes, car la Famille habitait le quartier Romema de Jérusalem. Et elle réveille certainement en leur sein l’hostilité foncière que suscita dès le 18ème siècle en Europe, le hassidisme braslav dont se réclament Daniel Ambash et sa Famille. Elle dérangeait aussi une certaine intelligentsia qui tient à se dire "de gauche" et qui, tel l’historien Zeev Sternhell, nourrit une haine viscérale vis-à-vis du "religieux", toutes diversités confondues. A cette détestation émanant de sources aussi diverses et opposées, s’ajoute celle, très saine, du grand public vis-à-vis des sectes qui prolifèrent librement en Israël. Face à une telle coalition objective, rassemblant toutes les catégories de la population, la Famille Ambash a-t-elle une seule chance d’être réhabilitée ? La Famille Ambash n’a qu’une seule chance, celle de la Justice. La Justice a le devoir de dire la vérité, même si cette vérité dérange la majorité, et donc a le devoir aussi d’aller à contre-courant. Malgré notre scepticisme actuel, tant cette"Affaire " est mal partie, nous croyons que la Justice finira par s’imposer. Notre conscience citoyenne et juive nous donnent cet espoir. Plus nombreuses seront les voix l’y appelant, plus vite cela se fera. La Justice de notre pays, précisément sur cette Affaire, a déjà montré qu’elle savait revenir sur son jugement. En effet, les 4 femmes, emprisonnées durant une année, furent disculpées, une fois que la Justice convint que l’accusation ne reposait que sur des interrogatoires non-conformes aux règles et des témoignages extorqués par différents types de pression. Bientôt, le 28 Mars, suite l’Appel de Daniel Ambash, la peine encourue par lui (26 ans de prison) sera, soit infirmée par les Juges de la Cour Suprême, soit confirmée voire aggravée à la demande du Procureur (65 ans de prison). La première possibilité serait, dans le contexte actuel, miraculeuse. La seconde, la plus probable, nous convie d’ores et déjà à un engagement de longue haleine dont la seule motivation est l’idéal juif de justice. Réponses des femmes aux objections de nos amis. Ces deux dernières semaines, nous nous sommes adressés à nos amis les plus proches dans le but de les informer et de les alerter. Certains ont de suite demandé quoi faire. La majorité a préféré ne pas se prononcer : le dossier est certes très compliqué. Certains qui au début s’étaient tus car ils croyaient effectivement qu’on avait à faire à une secte, nous ont remercié d’avoir pris le temps d’écouter ces femmes. D’autres enfin ont émis des objections. Nous les remercions tous. Désirant connaitre la réponse de Shiran et Aderet à ces objections, nous les leur avons communiquées. Voici leurs réponses. « Certainement ! " » se sont exclamées de concert, Shiran et Aderet. 25 jours exactement après l'arrestation de Daniel et 2 ans avant le jugement, les chefs de la police et des services sociaux de Jérusalem, en conférence de presse, assurent la cinquantaine de journalistes que la Famille Ambash est bien une "Secte sadique de Jérusalem". "On a donné la parole à tout le monde, mais, nous, on est interdit de parole, et nous pouvons à nouveau être condamnés pour n’avoir pas respecté cette interdiction ". "La polygamie est interdite en Israël ". Avec la nuance qu’elle n’est pas interdite aux musulmans, les femmes nous font remarquer que « Daniel Ambash a été accusé de plusieurs choses (esclavage mental et abus contre les femmes et les enfants, notamment), sauf de polygamie ! ». "Le consentement des femmes est d’une affligeante banalité ". "Enfants privés d’école et poussés à la mendicité" : Double et fausse assertion. Scolarité. L’une des femmes qui est institutrice de profession, Aderet, nous explique. A l’instar des adultes du quartier ultra-orthodoxe de Jérusalem où habitait la famille de Daniel, les enfants se mirent à persécuter les enfants Ambash, notamment à l’école du quartier. La famille prit donc la décision d’ôter les enfants de l’Ecole et s’unissant à d’autres familles, ils fondèrent une Ecole privée, avec leurs propres fonds. L’enseignement privé existe bel et bien en Israël. Nous connaissons d’autres exemples de prise en charge scolaire directement par les familles : nous ignorons si cette pratique est illégale mais on ne peut dire que les enfants Ambash avaient été laissés sans enseignement. "Les services sociaux qui ont interrogé les enfants le savent bien puisqu’ils s’étonnèrent de l’intelligence et des connaissances des enfants", précise Shiran. Mendicité : Aderet et Shiran nous ont dit que les enfants Ambash avaient été spécialement filmés à leur insu, pendant très longtemps, justement en quête d’une preuve de mendicité. Mais pas la moindre image illustrant cette pratique n’a pu être brandie contre Daniel durant le procès. Les femmes sortent leur Iphone et nous montrent des photos de cet enfant quelques années plus tôt (que l’on peut voir aussi sur le site www.danielambash.info) : « a-t-il vraiment l’air d’un enfant"victime d’un gourou dangereux " comme le dit votre ami…», nous demandent-elles ? Puis, elle nous montre des dizaines de morceaux de vidéos où tous les enfants sont acteurs, clowns et musiciens. « La demeure des Ambash avait été transformée en théâtre, en studio d’enregistrement et en salle de concert !». Et on peut facilement l’imaginer, que pour les enfants, ce devait être le paradis. Par contre, Ziva et moi qui cumulons plus de 90 années de travail sur l’image, affirmons formellement n’y avoir vu aucun signe de peur ou"d’esclavage mental ". C’est ainsi que notre ami précité a caractérisé Daniel, comme si cela pouvait constituer un motif d’accusation. Daniel était effectivement "hors-normes" : danseur surdoué ayant travaillé avec les plus grands de sa discipline (notamment Béjart), il abandonne cette voie pour venir en Israël, y faire"téchouva " et s’impliquer dans la spiritualité hassidique des Brestlav. Daniel a été par la suite séduit par la musique d’un autre personnage "hors normes", le rabbin-hippie-chanteur hassidique Braslav, Shlomo Carlibach dont les mélodies nous bouleversent. La première des femmes incriminées, Ilana, est aussi "hors normes" : violoniste, championne de France de Kung Fu, Techouva aussi, et mariage avec Daniel contre le gré de ses parents habitant en France. Une famille entière transformée en artistes et composée de 6 femmes, d’un homme et de 17 enfants, vivait en bonne harmonie, et effectivement tout était"hors-normes " chez les Ambash. Mais en quoi serait-ce là délictueux ? Israël aurait-t-elle vocation à ne produire que de la norme ? Mercredi soir, Ziva et moi avons écouté deux magnifiques femmes : Aderet et Shiran. Comme les deux autres, Ilana et Azamra, elles n’ont jamais flanché malgré des interrogatoires éprouvants, l’année de prison qui leur a été infligée et la séparation de leurs enfants. Deux femmes bien vivantes, qui nous ont fait beaucoup rire d’ailleurs. Elles réagissaient au quart de tour à toutes nos questions, sans hésiter, sans choisir leurs mots, en un mot, sans tricher. Elles n’avaient aucune agressivité. Au contraire beaucoup de distance et d’humour, malgré l’immense tragédie qui en aurait écrasé plus d’un, plus d’une. Avec leur don de comédie elles préféraient contrefaire tout ce qu’elles avaient subi. Elles argumentaient et prenaient notre raison et notre logique à témoin. Par exemple : « si nous étions des"esclaves mentales " comme cela a été dit, n’aurait-il pas fallu bénéficier d’une prise en charge psychologique plutôt que d’être emprisonnées ? ». Ou encore : « Pourquoi la Justice nous a-t-elle acquitté une fois convaincue des faux-témoignages de certains témoins, et maintient-elle Daniel condamné sur la base de ces mêmes faux-témoignages? » (voir rubrique "Perjury"). Il n’est pas de notre compétence ni de notre désir de nous étendre sur la pertinence du jugement. Par contre ce dont nous pouvons sûrement témoigner, à moins d’être aussi la proie"des pouvoirs télépathiques de Daniel Ambash", c’est que ces femmes ne sont pas des"esclaves mentales" de leur supposé gourou (dont elles sont séparées depuis plus de 3 ans). Ces femmes n’ont rien de zombies, croyez-nous ! Malgré la catastrophe qui s’est abattu sur cette Famille, au lieu de se taire, elles parlent. Au lieu de se renfermer, elles vont vers le monde. Au lieu d’être agressives et de récriminer, elles expliquent. Au lieu de s’en prendre à leur peuple ou aux autorités, elles se contentent de témoigner et de répondre sans aucune gêne à toutes les questions que l’on peut leur poser. Au lieu de pleurer, elles rient et elles chantent. Telle n’est pas la posture de gens se sentant coupables, tout le contraire. Pour nous, elles sont un exemple de la réponse juive face à l’épreuve. En vérité, nous sommes fiers d’elles, et nous leur avons dit que nous les soutiendrons. Nous sommes persuadés que nous ne serons pas les seuls, même si cela prendra du temps pour que chacun puisse se faire sa propre opinion. Nous tenons aussi à ajouter que si nous laissions sans assistance ces personnes en danger, nous donnerions du grain à moudre à tous ceux qui se sont fait une spécialité de la détestation de leur propre pays, au nom de la Morale et des principes de droits de l’homme, pactisant sans aucune honte avec ceux qui désirent purement et simplement notre disparition comme Pays et comme Etat. Nous croyons en la Morale et aux principes de droits de l’homme, mais pour renforcer notre pays, pas pour le détruire. Nous avons déjà suffisamment d’ennemis patentés pour cela. Très attristés que tant d’énergie ait été et continue d’être dépensée pour un résultat aussi tragique que l’emprisonnement quasiment à vie d’un homme, certes "hors normes", et le démantèlement d’une famille qui fut heureuse, nous appelons donc toutes les femmes et les hommes de bonne volonté à s’informer et à agir en leur âme et conscience. Des livres de témoignages en 3 langues (hébreu, anglais et français) existent désormais : les femmes nous ont dit qu’elles peuvent les faire parvenir à qui le désire. Elles sont aussi prêtes à parler à tous ceux qui le voudront. Nous pouvons aider à cela : pour des rencontres de vie, notre maison sera toujours ouverte. Bien à vous toutes et tous et désolés pour tout ce temps que nous vous avons pris. Asher Zelmati lives in Israel for over thirty years, student of Rav Ashkenazi, said "Manitou". Ophrah and Asher are members of the International Committee to Support the artist Daniel Ambash. Ophrah and I have had the opportunity to meet Daniel Ambash in prison in Ramle. It was the first time we entered a prison. We met a man living in conditions that exceed fiction. After all, this is the rationale of a prison: society has to protect itself from dangerous individuals. On the other hand there is no smoke without fire: one cannot be innocent if he is in prison. Finally, it is best not to ask too many questions, to keep conscience clean and to maintain our hard won well-being. Behind the numbing thoughts and evil accusations, there is an unbearable reality, smelly, unacceptable to my soul because there are too many lies, manipulations and testimonies extracted under torture. I am appalled to see this man humiliated, reduced to a lower status than a slave. A poor man convicted without evidence and without any fair trial. How is it possible to celebrate Passover, the feast of liberation, in these conditions? We are accustomed to the idea of nti-Semitic lies that depict the Jew as the vile beast to better justify their crimes. We are used to hunt this nauseating smoke to better confuse the crime of these anti-Semitic. In the case of Ambash case, we do not dare, we fear, well ... we remain passive and complicit. But make no mistake, the virus continues its work. Today it is Ambash far from being the only one in this situation, tomorrow it will be the future Ambash. Why would it stop in since no one says anything? If you really want to get rid of the chametz of Passover, so please take few minutes of your time to learn about the Ambash Affair. Here are 3 links (in Hebrew): a TV show on 1 Israeli, suggesting a beginning of truth on this matter and a testimony of a daughter of Ambash and the interrogation of a child of the Amabash family . Asher Zelmanti vit en Israel depuis plus de trente ans, élève du Rav Ashkenazi, dit «Manitou». Ophrah et Asher sont membres du Comité International de soutien à l’artiste Daniel Ambash. 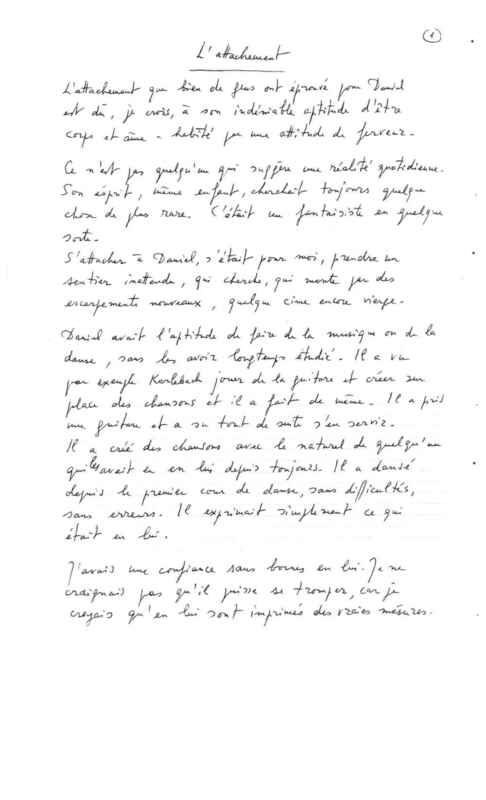 Nous avons eu la chance, ma femme et moi, de rencontrer Daniel Ambash dans sa prison à Ramlé. C’était la première fois que nous nous rendions dans une prison. Nous y avons rencontré un homme vivant dans des conditions qui dépassent la fiction. Après tout, c’est la raison d’être d’une prison : il faut bien que la société se protège des individus dangereux et en particulier de cette bête immonde qu’est le terrorisme. D’autre part n’y a pas de fumée sans feu : on ne peut être innocent en prison. Finalement, mieux vaut ne veut pas se poser trop de questions, rester la conscience tranquille, préserver un bien-être difficilement acquis. Derrière les pensées anesthésiantes, derrière les accusations diaboliques, il y a une réalité insupportable, nauséabonde, inacceptable à mon âme car issue de beaucoup trop de mensonges, de manipulations et de subordinations de témoins. Je suis effaré de voir cet homme humilié, réduit à un statut plus bas qu’un esclave. Un pauvre homme accusé sans preuves et sans procès élémentaire. Lorsque Daniel Ambash me parlait, assis dans son habit orange de prisonnier, je regardais ses yeux que la souffrance et les mauvaises conditions avaient légèrement embrumés. Il parlait sincèrement du cauchemar qu’il vivait, de ses conditions d’incarcération, de tout ce qu’il y avait d’invraisemblable dans la succession des événements qui l’avait amené derrière les barreaux et je me demandais : comment est-ce possible ? Je regardais Daniel et j’avais honte de ne pouvoir lui dire que des amis proches, bons, cultivés n’avaient pas le courage de faire face à l’énorme mensonge construit autour de son histoire, même si peu d’entre nous partagent sa manière de concevoir le couple. Mes amis, je remercie chaque jour d’avoir un pays et un peuple qui ont su, en quelques décennies, à partir d’individus venus des quatre coins du monde, construire notre Israël tant aimé et faire surgir ses richesses matérielles et spirituelles. Comment ne pas être indulgent après 78 ans d’indépendance ? Mais quand je vois se démener chaque Israélien à l’approche de Pessah pour célébrer de la façon la plus rigoureuse qui soit la fête de la Liberté, je ne comprends plus. Nous sommes acquis à l’idée des mensonges des antisémites qui dépeignent le Juif comme la bête immonde pour mieux justifier leurs crimes. Nous sommes habitués à chasser cette fumée nauséabonde pour mieux confondre le crime des antisémites. Dans le cas de l’affaire Ambash, on n’ose pas, on a peur, enfin… on reste passif et complice. Mais ne vous y trompez pas, le virus continue son travail. Aujourd’hui c’est Ambash, loin d’être un cas isolé, demain ce seront les futurs Ambash. Pourquoi cela s’arrêterait-il en effet puisqu’on ne dit rien ? Et comment fêter Pessah dans ces conditions ? Si vous voulez vraiment vous débarrasser du Hametz de Pessah, alors prenez je vous prie quelques minutes de votre précieux temps pour vous renseigner sur l’affaire Ambash, l’histoire vraie d’un artiste innocent en prison. אופרה ואני זכו לפגוש את דניאל אמבש בכלא ברמלה. זאת הייתה הפעם הראשונה שנכנסנו לבית הסוהר. פגשנו אדם שחי בתנאים שלא ניתן לתאר לעצמינו. אחרי הכל, זהו הרציונל של בית הסוהר: החברה חייבת להגן על עצמה מפני אנשים מסוכנים. מצד שני אין עשן בלי אש: אדם לא יכול להיות חף מפשע אם הוא בכלא. לבסוף, עדיף לא לשאול יותר מדי שאלות כדי לשמור על מצפון נקי ועל שלוות הנפש שעבדנו עליה כל כך קשה. מאחורי המחשבות המרגיעות וההאשמות הרעות, קיימת מציאות קשה מנשוא, מסריחה ושלא מתקבלת על הדעת כי יש יותר מדי שקרים, מניפולציות ועדויות שנסחטו תחת עינויים. אני מזועזע מלראות את האיש הזה מושפל, מופחת למעמד נמוך מעבד. איש מסכן שהורשע ללא ראיות וללא משפט הוגן. איך אפשר לחגוג את חג הפסח, את חג השחרור, בתנאים אלה? אנחנו רגילים לרעיון של שקרים אנטישמים המתארים את היהודי בתור מפלצת כדי להצדיק את פשעיהם. אנחנו רגילים לצוד את הסרחון הזה כדי לבלבל טוב יותר את הפשע של אנטישמים הללו. במקרה של משפט אמבש, אנחנו לא מעיזים, אנחנו חוששים, טוב ... אנחנו נשארים פסיביים ובעצם שותפים לפשע. אבל אל תטעו, הווירוס ממשיך את עבודתו. היום זה אמבש רחוק מלהיות היחיד במצב הזה, מחר זה יהיה האמבש העתידי. אך למה זה יעצור מאחר שאף אחד לא אומר דבר? אם אתם באמת רוצים להיפטר מהחמץ של פסח, אז בבקשה קחו כמה דקות מזמנכם כדי ללמוד על משפט אמבש. הבן של דניאל אמבש בראיון לטלוויזיה הצרפתית: " אנחנו חיינו טוב "
I., son of Daniel and Ilana Ambash, 18 years old, says : " They call us the "sadistic cult of Jerusalem", I say : we were not a normative family but welived well, we were a happy family." I., fils de Daniel et Ilana Ambash, 18 ans, dit : "ils nous surnomment la "secte sadique de Jérusalem ", moi je dis : nous étions une famille certes anormale mais nous vivions bien, nous étions une famille heureuse "
Dorit Darai's testimony about the lies of the prosecution witnesses. She lived with the Ambash family for six months, 2009. Avi Tal. Ambash family's soundman for 4 years. 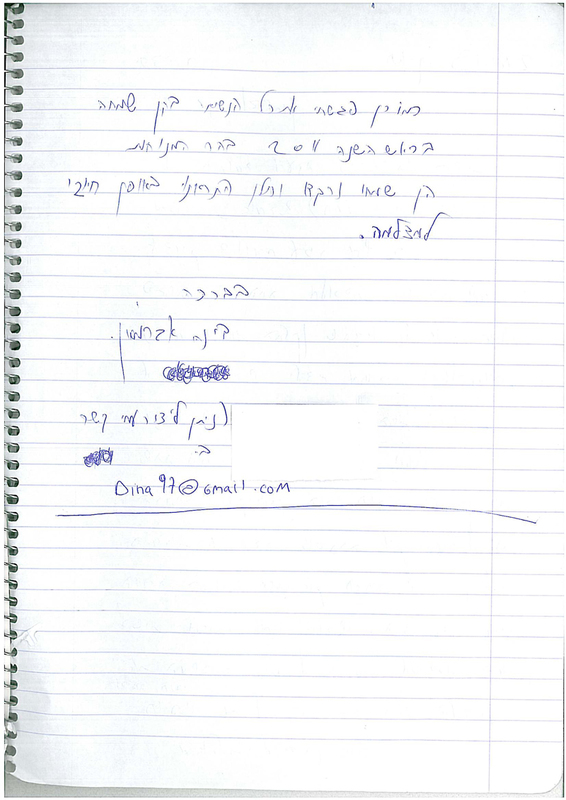 Testimony of David Kashdan, a friend who lived with the over 18-year-old boys of the Ambash family, in the recording studio of Givat Saul, for 5 years, 2005 -2010. עדות של דוד כשדן, חבר שגר עם הבנים הבוגרים של משפחת אמבש באולפן ההקלטות הביתי בגבעת שאול, במשך 5 שנים בין 2005-2010. At some point, Daniel experienced a Jewish reawakening and began to study in a French yeshiva. He divorced his first wife, who was not Jewish, and married Ilana, who comes from a French-Sefardic family. Shortly thereafter he met Rabbi Odesser, who had come to France to publicize the Letter From Heaven he received from Rabbi Nachman of Breslov. Daniel was very taken with Rabbi Odesser’s message and quickly became a devoted follower. Soon he moved his young family back to Israel , the land of his birth. I met Daniel, along with many other recent French Olim (Jewish immigrants to Israel ), in the Aliyah Center in Mevasseret Tzion outside of Jerusalem . Rabbi Odesser would stay with different families in this center, and when I came to see him I met his young French hosts too. I was immediately taken by all the French Jewish families I met, and especially by Daniel. In my experience as a participant in the Na Nach movement over a seven year period, I found almost all the Na Nachs, whether native Israeli, or French or American Olim, to be brilliant and creative people, deeply passionate about their beliefs and deeply committed to the cause of publicizing Rabbi Odesser’s “Petek” to the world. But of all the wonderful people I met, none surpassed Daniel Ambash in creative brilliance. Besides being a dancer, Daniel was a talented painter. He taught himself Jewish scribal arts and also became adept at various kinds of computer software that he utilized in a publishing operation. He was a brilliant Torah student and deeply familiar with the voluminous writings of Rabbi Nachman of Breslov. Daniel mastered pretty much whatever he put his mind to. He also was a deeply compassionate person, warm and friendly, who loved to have guests in his home for Shabbat. He also had a sharp and ironic sense of humor. Once, for example, when we were visiting Rabbi Odesser’s grave in Jerusalem , Daniel quipped, upon seeing a group of very scantily clad women in the cemetery: “Maybe they are trying to help raise the dead from their graves.” His wife, Ilana, was supportive of all his endeavors, as well as a very efficient homemaker raising a large and growing family. They also had Rabbi Odesser as a guest in their apartment for frequent long stays, which imposed no small hardship on their family but which they accepted cheerfully. In short, Daniel and Ilana struck me as an ideal couple with an ideal family life. When Ilana told me that she thought Daniel should marry Esther, I knew she was right. I was troubled and hurt, simply because of the horrible awkwardness of surrendering one’s wife to one’s friend. But still I knew it was best for all parties involved. And even though afterwards Daniel continued to be friendly to me, I never was able to visit his home again due to my sense of shame about the whole matter. The last time I saw Daniel was at the Arizal mikveh in 1999. He was friendly and told me that I was always welcome to visit his family. But I never again saw him or stepped inside his home. During the past 12 years that I have been away from Israel , I have had frequent dreams about Daniel and his family. I know that his unconventional lifestyle has provoked much controversy in Israel , as well as a police investigation. 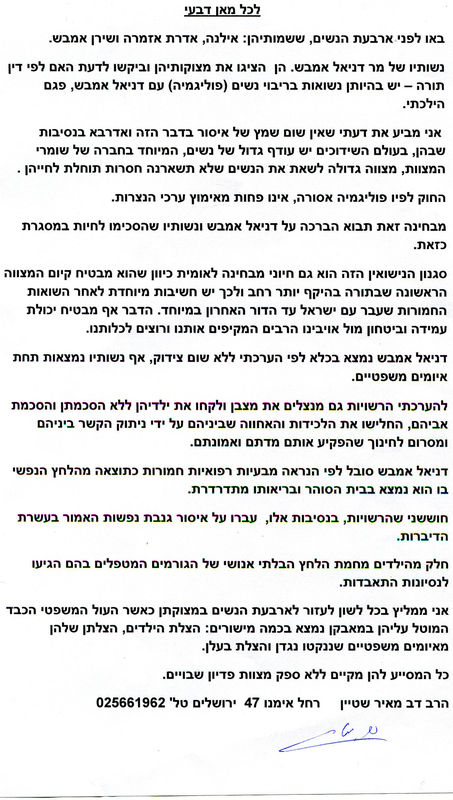 It is my prayer that by providing this background information, along with an English translation of the transcript of a recent very favorable Israeli TV news report about his family, this will somehow vindicate in the eyes of the public the reputation of a former close friend and colleague in the Na Nach Breslov Chassidic movement. Sincerely Michael Korn PS Daniel once told me that, because his mother is Sefardic, according to Halacha he is permitted to marry more than one wife, because the Sefardim never accepted the decree of Rabbeinu Gershon, about 1000 years ago, banning polygamous marriage for European Jewry. And although it is not common for Sefardic Jews to have multiple wives, some Sefardim have practiced this, including the famous rabbi Baba Sali. And on a personal note, in an age of rampant divorce, shattered families, and neglected and abandoned children, I find it both ironic and repugnant that anyone would criticize the loving and harmonious family unit that Daniel and Ilana Ambash have endeavored, with the help of God, to create. Let he who is without sin cast the first stone at them. PPS See a similar case of Mormon polygamist Tom Green, who was arrested and his family of six wives and thirty children left destitute. Testimony of a neighbor who lived for ten years in an apartment linked to the family Ambash’s apartment, 2001-2011. Testimony of Dina Abramson, TV journalist of Chanel 2, program 360, October 2013. עדות של דינה אברמסון עיתונאית התוכנית 360. אוקטובר 2013.